The basic science behind laser printing is the use of static electricity, which is combined with heat. The photoreceptor or drum is a large cylindrical object that can hold a static charge. At the start of the printing process, the drum is given an entirely positive charge from a component called a corona wire. As the drum rotates, the laser points at the drum in precise patterns, discharging the static charge wherever it is pointed. This gives these areas a negative charge. The toner is positively-charged, and attracted to the negatively-charged portions. When it is released, it is drawn to the drum in the areas of negative charge. The drum then rolls across the paper and releases the toner particles onto the paper in the same pattern. 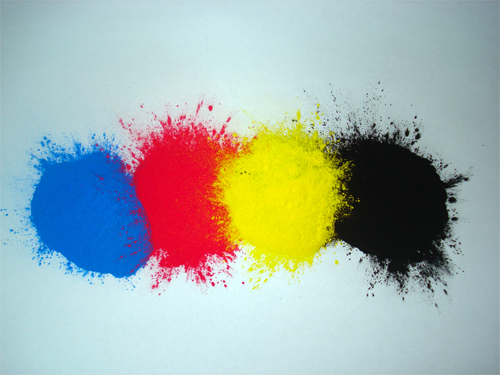 Color printers use multiple drums: one for each color of cyan, magenta, yellow, and black. This is a continuous process, where the laser is etching portions of the image at the same time that some particles are being attracted, while at the same time others are being transferred, so there is a lot of coordination required. 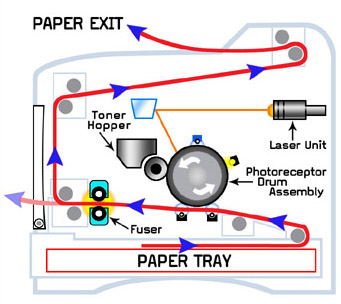 Once the toner particles are aligned on the page, the paper goes through the printer fuser assembly, which contains one or more heated rollers. The fuser applies the heat necessary to melt the toner particles, so that they are fused to the paper. This is the reason pages that come out of a laser printer often feel warm. The technical aspects of getting all of the components to work perfectly together is quite a feat of engineering, but the basic science is fairly easy to understand. A laser printer can produce a wide variety of text and images with the use of static electricity and heat, and at a very high rate of speed.